FibreSMART is a unique dietary fibre supplement. It is not only a source of dietary fibre, but a complete digestive care formula. It is much more than just fibre. It combines the perfect 50% soluble and 50% insoluble blend of fibre along with healing herbs. 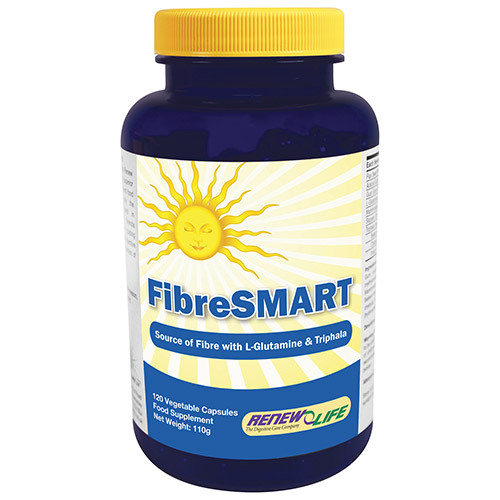 FibreSMART is the perfect everyday fibre supplement to help maintain good health, ease constipation, and improve digestion. It is also the ideal cleansing companion! Powder of Flax Seeds, organic (Linum usitatissimum), Acacia Gum, organic (Acacia senegal), Vegetable Capsule Shell (hydroxypropyl methylcellulose, water), Guar Gum (Cyamopsis tetragonoloba), L-Glutamine, Marshmallow Root (Althaea officinalis), Slippery Elm Bark (Ulmus rubra), Belleric Myrobalan Fruit (Terminalia bellirica), Chebulic Myrobalan (Terminalia chebula), Indian Gooseberry Fruit (Emblica officinalis), Vegetable Cellulose (hydroxypropyl methylcellulose, water). Take 4 vegicaps per day. You can take up to 12 vegicaps per day. Below are reviews of Renew Life FibreSMART - 120 Vegicaps by bodykind customers. If you have tried this product we'd love to hear what you think so please leave a review.